If you want more detail on the last week's AES Exhibition, check out the latest episode of my Inner Circle podcast. There's a more in-depth conversation about the most interesting gear that I saw during my travels around the show. 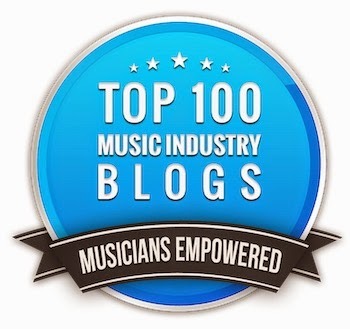 No commentary on music or the music business this time, just gear, gear and more gear! 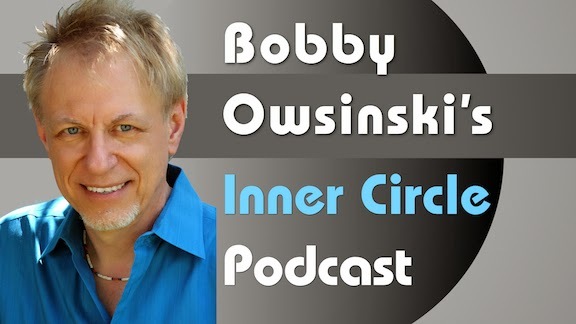 Remember that you can find the podcast either on iTunes or at BobbyOInnerCircle.com, and now also on Stitcher. It's time for a look inside another classic hit. This time it's the isolated vocals from The Beatle's masterpiece album Abbey Road with the Ringo centerpiece "Octopus's Garden." Let's take a close look at the vocals. The quality isn't that great (it sounds like it's the isolated center channel derived from a vinyl record), but you still get the idea. 1. Ringo has an interesting vocal trait in that the end of each phrase is always a little flat. 2. The vocals are bone dry. 3. Listen to the vocal double on the B-section. It's not very closely matched, but still does the job. 4. The harmony background part during the bridge has a strong vibrato on it, and you can really hear the bubble sound effect. 5. The Beatles harmony vocals were always top-notch, as they are here in the chorus. They sound like they were double tracked. 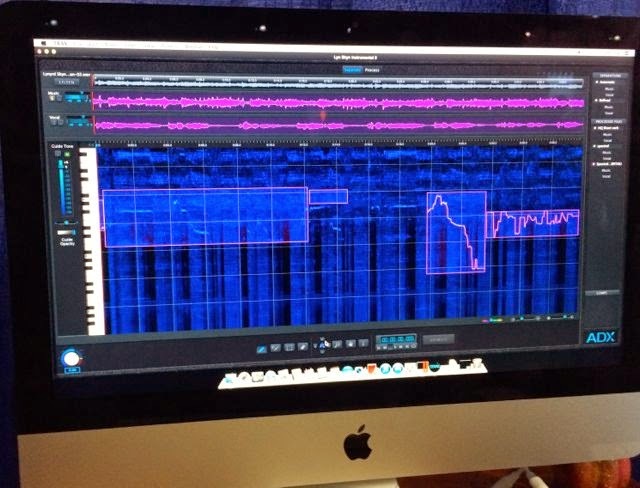 Roger Linn, the creator of some of the modern drum machine with the LinnDrum and later the MPC60, is at it again. Roger has developed a brand new instrument that is as much a human instrument as it is electronic with his new LinnStrument. A few years ago Roger was awarded a Technical Grammy for his lifetime achievement in truly groundbreaking designs, and he's trying to revolutionize the industry once again with his new instrument as much as the LinnDrum did back in 1982. The LinnStrument goes beyond what a typical synth keyboard can do in that it's touch sensitive, so if you wiggle your finger you'll get vibrato, and slide it along the unit you'll get a nice portamento. The "keyboard" splits so both hands can play different instruments or loops, and it's designed along a grid system rather than piano-style for easy transposition. The LinnStrument is slated for release at any time and should cost around $1500. You can find more information and a number of great videos here. Here we are at the last of the AES Show wrap up reports. 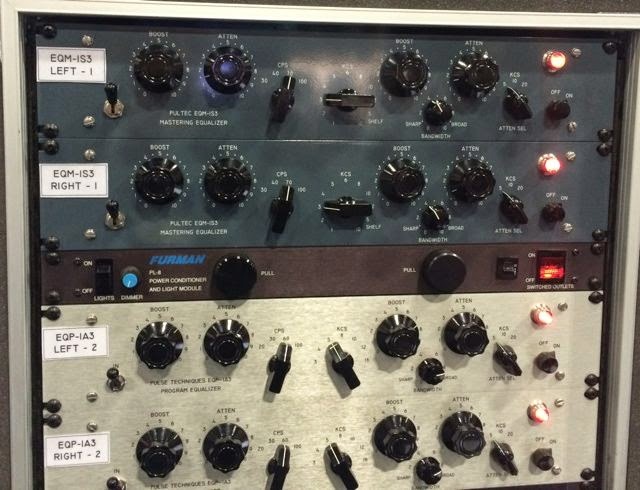 Today I'll look at outboard gear and miscellaneous cool stuff that defies a category. First up, outboard gear. 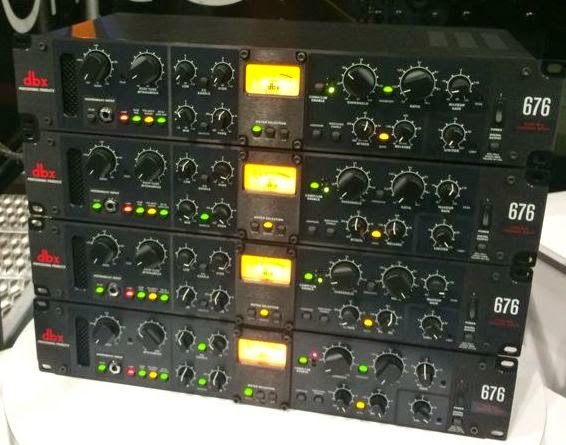 dbx show its 676 tube channel. It's a really good looking box with a tube mic pre, a 3 band parametric EQ and 162 compressor built in. The price is a reasonable $999. Pulse Techniques has brought back the entire Pultec line. If you always wanted to own a particular Pultec piece but didn't want to pay the vintage prices, here's a way to get a brand new one. Pulse Techniques claims these are all built to the original design specs. Prices go from $2500 to around $4500. One of the more unusual 500 Series line of products comes from the Awesome Transistor Amplifier Company. The pieces have a very unique graphic design, have are all discrete circuitry and use very high quality parts. You get the normal mic amp, EQ and compressor, but also a pretty cool way to turn it into a mixer with an external mixing controller. 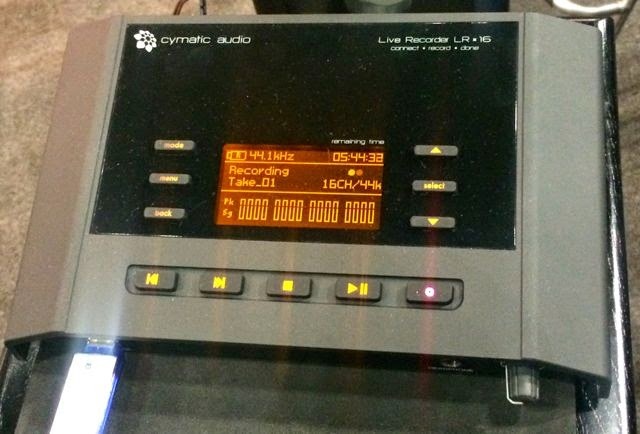 If you ever wanted to record a live show without dragging a full DAW with you, the Cymatic Audio Live Recorder is the answer. There are two models - the 16 track LR 16 that retails for $399 (a playback only version is also available) and the 24 track uTrack 24, which is a recorder/player and sells for $999. I'm a huge fan of Hearback and own one of their personal monitoring systems. Now the company has introduced the Hearback Pro which provides 16 channels with individual level controls, as well as an intercom to talk to various stations, aux, pan, presets and even a lockout to keep that mix from being changed. Radial is fantastic company that always has some new tool that solves a problem. 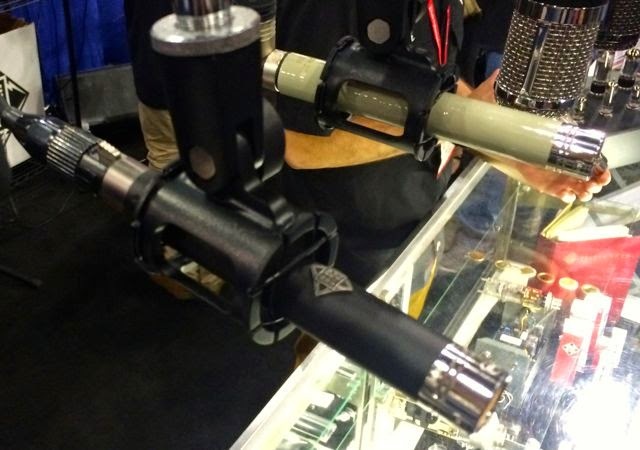 At AES they introduced the Headload, which is an amplifier attenuator with a few twists. The box has tunable resonance, speaker cabinet voicing, a DI out and even a phase shift control. Of course, there's also a headphone out for late night rocking out in your bedroom. Nagra was once the king of field recording and its trying to get back to where it once was with the introduction of a number of hand-held recorders that range from $975 on down. There are three models, the SD with its built-in high-quality mic, the mid-priced Lino and the Pico. These are built like tanks (like other Nagras actually) and definitely a step up from most others on the market. Finally, I've written about this before, but Triad-Orbit stands are just the bomb! Finally, the mic stand re-envisioned. 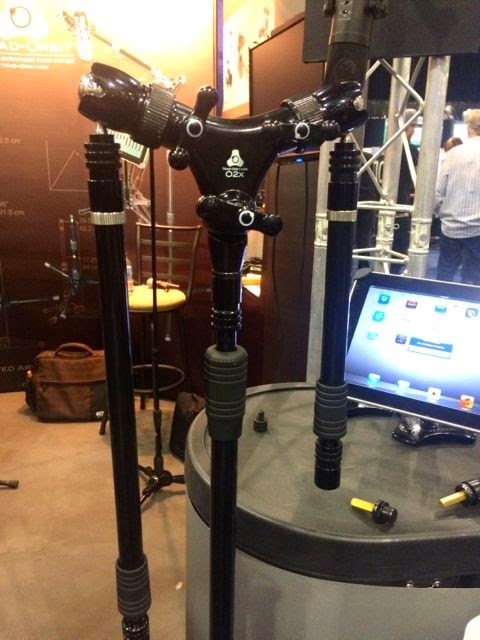 These are built to last a lifetime and have more small great ideas that a mere mic stand should have. The company has been building auto parts for a long time and this is a sideline, so they're not going away anytime soon. Definitely worth checking out. That's it. I'm sure I missed a few things, but these are the highlights that caught my eye. 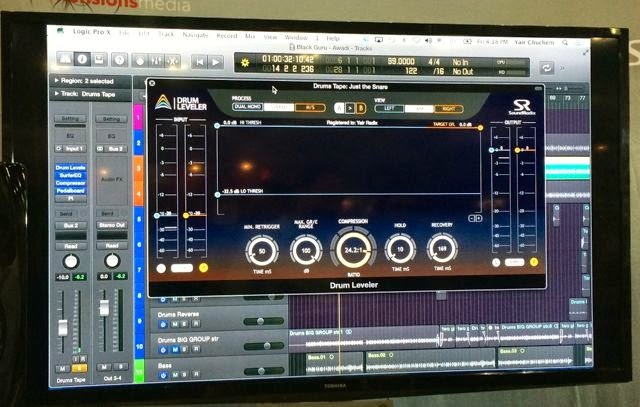 Yesterday I discussed new loudspeakers and software from this year's AES show. 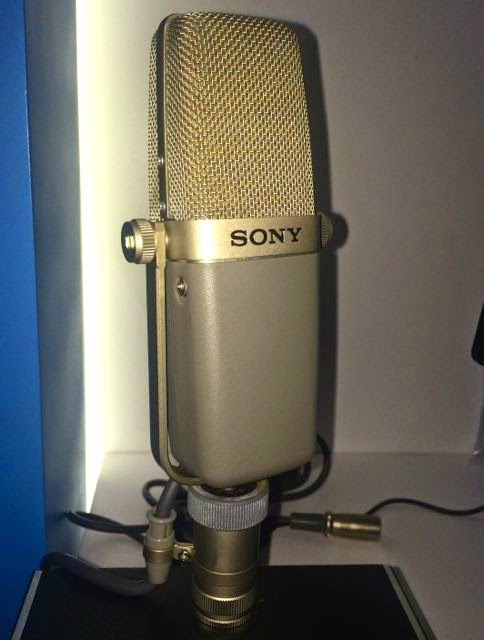 Today we'll look at microphones and consoles (yes, they're back - in a way). Here we go. 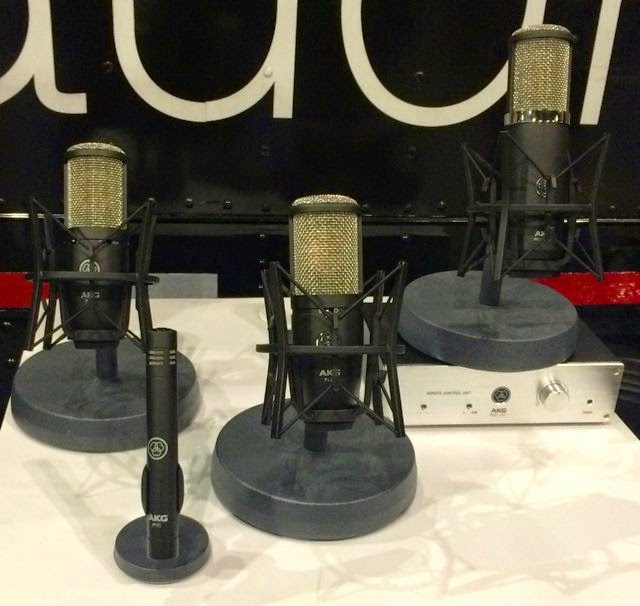 AKG launched some new mics in its Perception series. First is the small diaphragm P170 ($80), then there are a 3 large diaphragm entries - the P820 based around a tube ($700), the P420 ($200) and P220 ($150). I wasn't able to listen to them (not that it would have told me anything) and there was no literature readily available, so can't say much more. 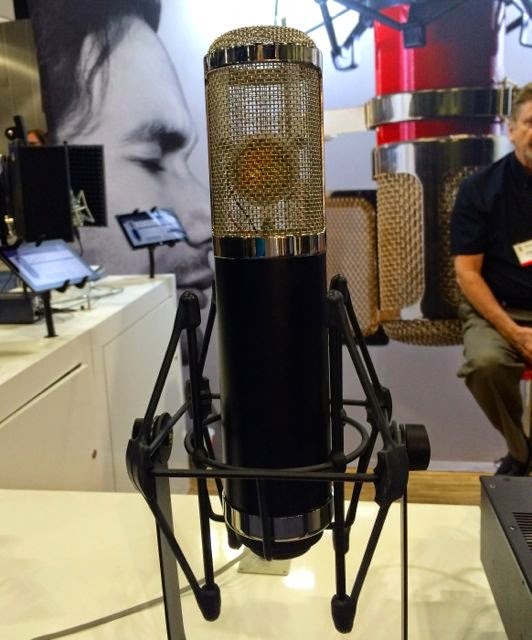 My friends at Advanced Audio released a KM84 style CM1084, which appears to be very versatile and is only $399. 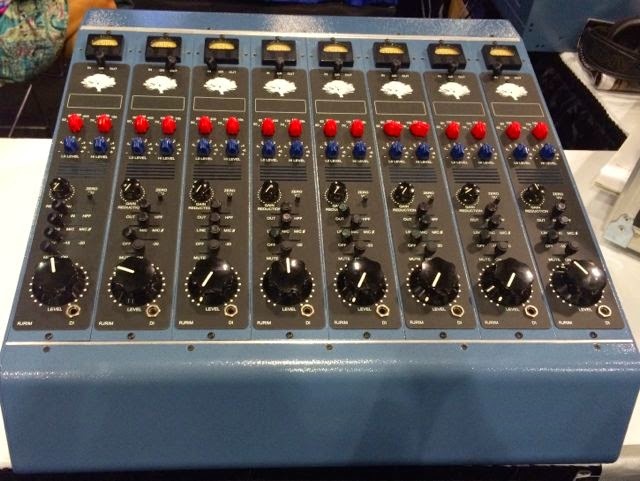 They also showed their 251 close, called the CM251, which sells for a very reasonable $995. I own a couple of AA U87 clones and they're great, so I can't wait to try these new ones. One of the coolest variation on the U47 comes from Cathedral Pipes. Owner and designer Charles Dickenson told me he put an LED beneath the grill as a joke when he was continually asked to make the mic brighter. It was only when people started to order it with different colored LEDs did he realize that was something that people really dug. 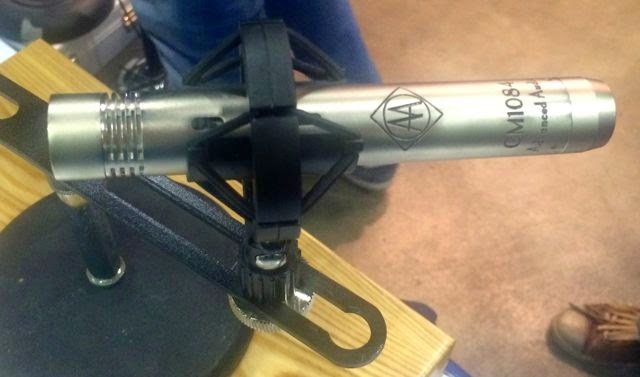 These mics are very meticulously hand-built in Southern California and sell for around $1500. There's also a cool version of the RCA 77 as well for only $800. Josephson Engineering showed their very cool C700 series. It's been around for a while but it never caught my eye. 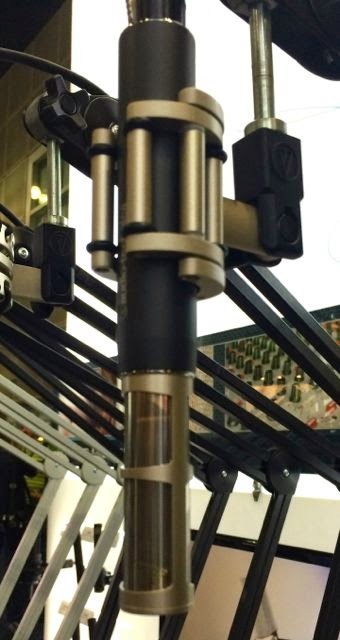 It's a combination Blumlein (2 figure 8 capsules) and MS mic (with a third omni capsule) rolled into one so you can change the directional pattern of the mic after you've recorded. Price is around $8k. 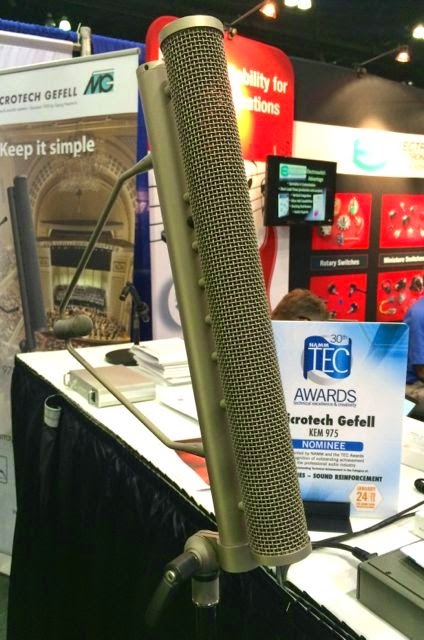 Another unique mic along the same lines was the Microtech Gefell KEM975 line array mic. 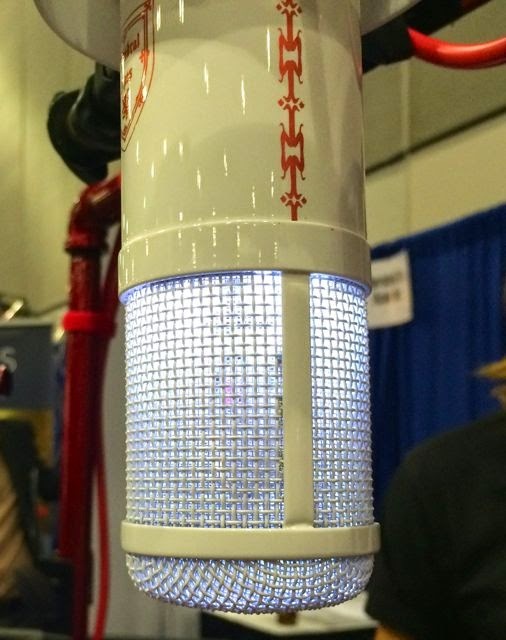 Just like a line array sound system you see at concert venues everywhere, this mic has 8 capsule elements. The idea is to make the mic very directional in a vertical plane so the mic only picks up what's in front of it, not above or below. A 9th mic at the rear of the main body is to extend the frequency response below 200Hz. It's up for a Tech Award and costs around $11k. Sony showed its C38B, a reissue that's been around for a couple of years but also skipped my attention. This was the FET followup to the amazing C37A. Sony says it's an exact reproduction and sells it for around $2200. Speaking of exact reproductions, Neumann has reintroduced its famous U47FET. Once again, it's supposed to be identical to the original version. It's around $4k. There are other very good reproductions around, but none of them say Neumann on the body. 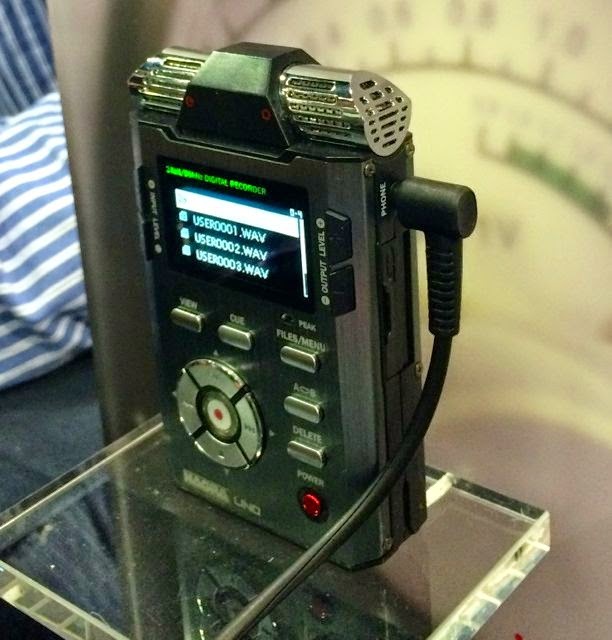 Audio Technica showed its brand new 5045, a side-address mic made especially for high SPL instrument capture. Despite its shape, AT says it has the largest diaphragm area of any mic it sells. The price is around $1600. 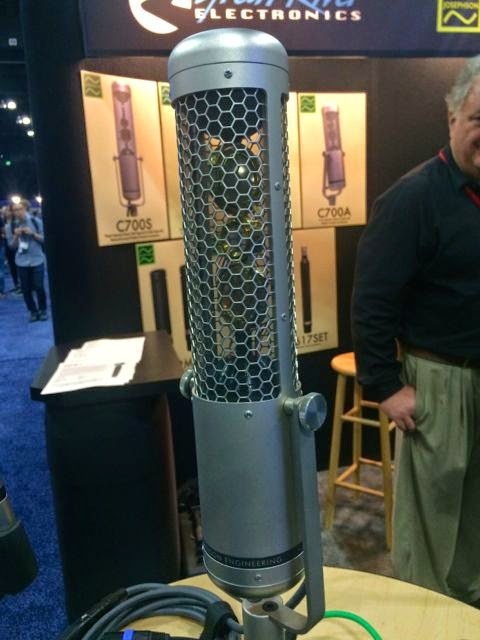 Here's an interesting mic from MXL called the Giga Mic. It has the largest body of any mic I've every seen; probably twice as long as the biggest U47. No info on the mic though. 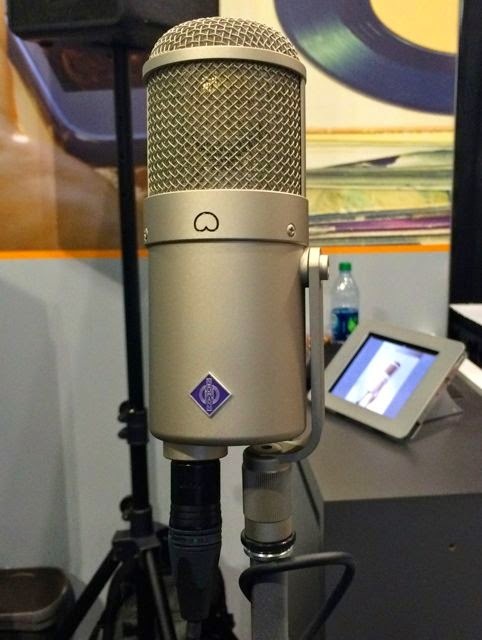 Finally, Telefunken USA brought out a new small diaphragm condenser called the M60 FET. It's the company's first FET mic. No price yet. Recording consoles made a bit of a comeback at this show. Trident finally showed a shipping version of its Series 88. 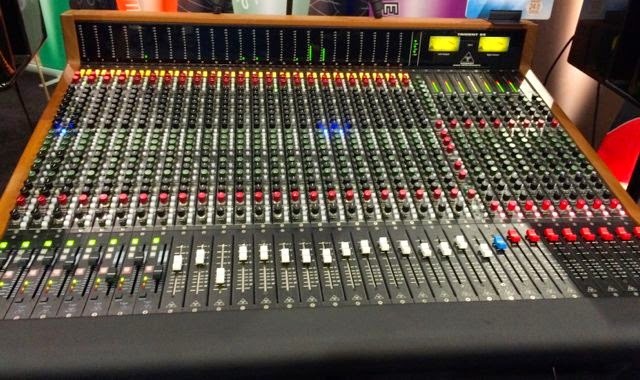 This one has 24 input strips with a 24 channel monitor section. 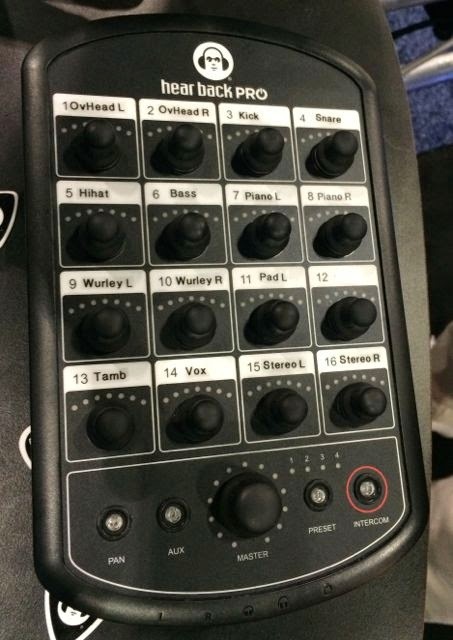 The inputs are also dual inline so there's 72 inputs for your mix. All this for around $25k. Geoff Daking showed his currently unnamed console, which was very cool indeed. It came complete with his Trident A-Range-style mic amps and EQ, plus dynamics on each channel and a cool routing with parallel compression in mind. It also has a very complete monitor section. Around $65k for the 24 input version. Tree Audio The Roots Jr. This Tree Audio The Roots Jr is basically The Roots console without the master section. Each channel has a direct out only. Around $16k for all tube retro audio. 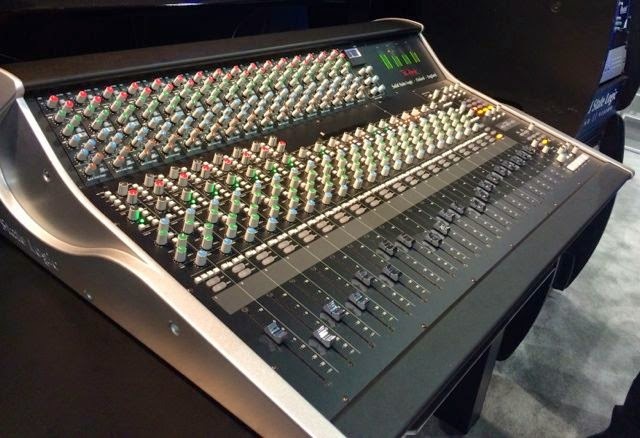 Finally, SSL showed its XL console, which is basically a mixer attached to a 500 Series rack. It comes with 8 SSL mic pres, 16 input channels, 4 stereo channels, the famous SSL buss compressor, 18 500 series slots and much more. The price is only $20k with empty slots. It's one of the more brilliant things I've seen in a long time. That's it for today. Tomorrow we'll look at outboard gear and miscellaneous audio stuff. The 137th AES Convention just wrapped up in Los Angeles, where the entire music creation community came together to teach and learn new techniques, show off some new gear, and just share the love. The show appeared to be small, taking up only one of the halls in the massive LA Convention Center, but the size was deceiving as there was so much going on. Most of the manufacturers I spoke with were very pleased to be in LA, since there's much more of a music business here now than in San Francisco and even New York, the two cities that the show usually alternates between. The last time the show was here was 12 years ago, but from the response, I bet we see it more frequently in the future. 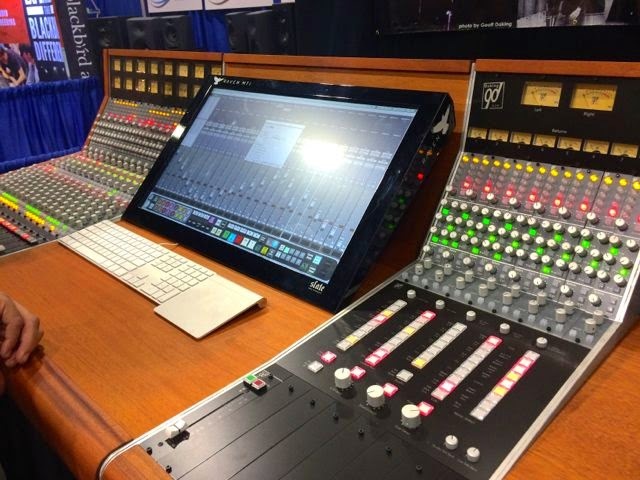 1) There were fewer smaller software and accessory companies exhibiting than at NAMM. 2) 500 series mania seems to have plateaued. Now let's get down to business, beginning with loudspeakers. Gibson was showing their Les Paul line of loudspeakers, complete with a nice flamed maple top front. I asked if these were simply rebranded KRK's (a company that Gibson now owns) and was told in no uncertain terms that wasn't the case. 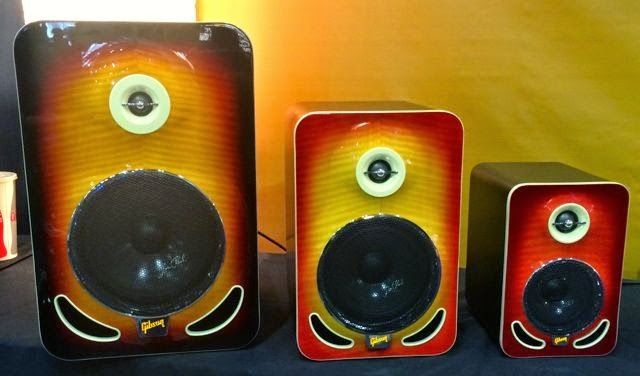 There were 3 speakers in the line - a two way 8" ($999 each), 6" ($799 each) and 4" ($599 each). They seemed to sound OK from what I could tell on the floor, but there was no information available other than the spiel by the booth guy. I guess my big question here is "Why?" 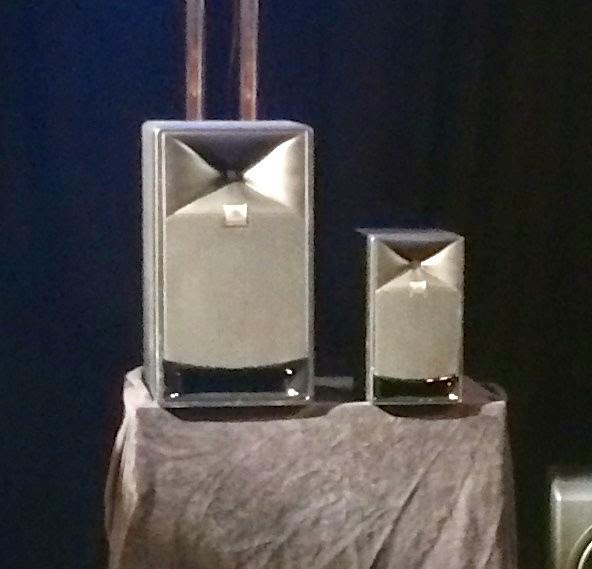 JBL showed its new Series 7 at a private showing at the Clive Davis Theater in the Grammy Museum. The Series 7 was made specifically for multichannel, from 5.1 all the way up Atmos, and were designed for a big sound from a small box. All I can say was, "Wow!" I don't think I've ever heard as much low end from a 5" woofer. The speakers come with mounting brackets for theaters, and are designed to sound the same off-axis, which I can attest to. I walked around the room and the sound was surprisingly close. The system sounds great but isn't cheap. A 5.1 system (the smallest they'll sell at the moment) comes with a BSS processor and an 8 channel amplifier and runs around $10k, but the system is just being introduced so prices and exact models and specs are fluid. Another speaker of interest is the Genelec 8531, a totally new design that breaks many of the rules of what we expect in a speaker. First of all, it's designed around the waveguide front baffle built around a dual concentric mid and tweeter, which means that it couldn't use a traditional woofer. 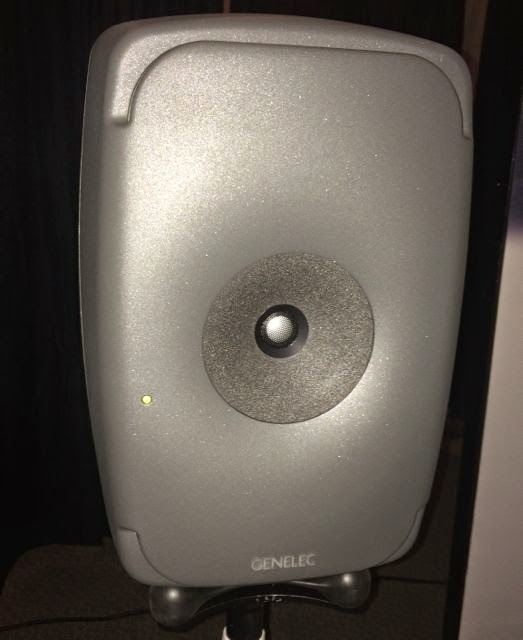 Genelec engineers came up with a new design that provides dual ellipsoidal woofers instead of the traditional round one. The result is a bandwidth that goes down to 32Hz from a relatively small box. Very cool. Like I said in the opening, there wasn't a lot of software at the show. Sure, big players like Waves, Slate, and iZotope were there, but not many of the smaller software companies for the most part. There was a few exceptions though. Sound Radix, the company noted for it's Surfer dynamic EQ plugin, introduced something called Drum Leveler, which has dynamic beat detection that allows you to change the level of individual drums within a loop. In other words, if you have a loop where you think the snare is too low, Drum Leveler will allow you to increase the volume. It also has dynamic upward and downward compression and expansion so you could even out an inconsistent drummer easier than with just a compressor. The price is only $149 when it's released next month. Sort of along those same lines is Audionamix and their ADX Trax, which provides audio source separation for DJs, remixers and audio post production. With ADX Trax you can easily isolate a vocal from a finished stereo track and either raise or lower the volume or eliminate it completely. Lots of other companies have tried this in the past, but this really works. And it's only $299, or you can subscribe for a mere $20 a month. Finally, Universal Audio introduced the Thunderbolt version of its very successful UAD-2 Satellite. The big difference is the newly updated versions are either in quad or octo formats, providing twice the processing power as before. The prices range from $999 to $6k, depending upon the software package. That's it for today. Lots more tomorrow as we look at new mics (lots and lots of new mics) and even the return of recording consoles. Also, I'll cover all this and more in this week's Inner Circle podcast.